It’s interesting isn’t it when big global sponsorship deals are made on little or no brand suitability of association. Messi is case in point, and so is his team FCB. It seems every brand with big enough cashflow for decent bragging rights is in on the action. (Would FCB survive at all without its eclectic yet numerous paid endorsements? Probably not.) Let’s put the spotlight on Telecoms for a minute or two. FCB is sponsored by a couple of big players in the Middle East. However one is far better structured with its CSR orientation through its specific association with the Messi Foundation. And it’s paying off with the World Cup hype and Mr Golden Boots making the sponsorship crafters feeling good about themselves. But here you go… one example of how it could have all come crashing down very fast for both telecom operators. It shows also that ill-informed almost illiterate participants of social media can pack a punch. What if Messi was a Jew? A smear campaign of Messi raised a surprisingly ugly head when some active members of Social Media – sparked and fuelled by the conflict in Gaza – showed Messi praying at the kissing wall in Jerusalem wearing the tell-tale white lace cap. Here they were accusing him of being a Jew and prompting the Muslim world to think twice about international herosim and for frothing football fans to rethink their allegiance/s. The company had signed the global deal without as much as assessing his religious standing. A dangerous overlook by a major company whose footprint covers mainly Middle East countries – also Indonesia which is (you guessed it!) also predominantly Muslim. Imagine what could have happened if major billboards, retail shops and television brand campaigns all featured Messi, and he was a Jew? Chief Commercial Officers would have negative revenue trendlines overnight, marketers would have to re-launch all major products and services under new creative campaigns and brand teams would be pulling stuff off the press and out of stores like Jumping Jack Flash. Last minute panic checks sounded after the Social Media smear campaign emerged. 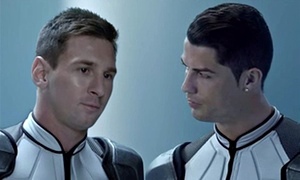 The difficult questions were asked – Is Messi really a good association for a largely Muslim brand? And for an instant, the shocking realisation that due diligence was not taken set in. Thank God (and Allah) that Messi is indeed a Catholic. Not as bad as being a Jew in Muslim quarters. But it still sounds the question of whether big Arab brands should be more stringent in assessing sponsorships and perhaps should stop Western hires from making all the decisions. In fact, with so much money being spent one would think it was about time these companies adopt a filter of “does it make sense for Muslims?” They should also adopt a standard practice of market research to test Western assumptions on the actual customer base, who are mainly Muslims. Brandblogette tends to think there are better ways to spend the money for operations to show a stronger, more genuine and emotional brand attachment to its audience. We are succombing to an illness of online hits & hype. This entry was posted in Brand, Brand Sponsorship, Marketing and tagged Brand, Etisalat, FCB, Messi, Muslim, Ooredoo, Sponsorship, World Cup. Bookmark the permalink.